Marsh, James H.. "Île-à-la-Crosse". The Canadian Encyclopedia, 04 March 2015, Historica Canada. https://www.thecanadianencyclopedia.ca/en/article/ile-a-la-crosse. Accessed 23 April 2019. Montréal-based trader Thomas FROBISHER built the first fur trade post in the area in 1776. Competing posts were set up by Alexander MACKENZIE in 1785 and the Hudson's Bay Company in 1799. From here the Athabasca brigades headed northwest. In 1846 Fathers LAFLÈCHE and TACHÉ established a mission. 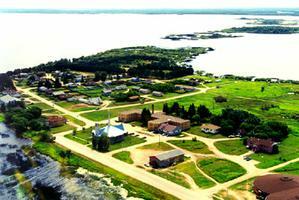 The community of Ile-\u00e0-la-Crosse is composed of three parts, Mission as seen above, town and new town, nicknamed Snob Hill (courtesy Village of Ile-a-La-Crosse). 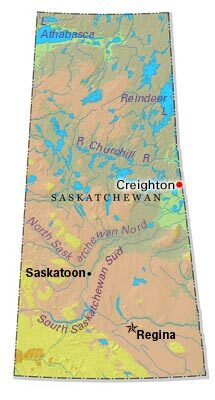 Île-à-la-Crosse, Sask, incorporated as a northern village in 1965, population 1365 (2011c), 1341 (2006c). The Northern Village of Île-à-la-Crosse is located on an expansion of the upper CHURCHILL RIVER, called Lac Île-à-la-Crosse. The name may derive from the shape of the lake - supposedly resembling a bishop's staff - or from an island in the lake on which the Cree played lacrosse. The lake provides a connecting route from the Churchill River to PORTAGE LA LOCHE and was thus a strategic spot in the FUR TRADE. Montréal-based trader Thomas FROBISHER built the first fur trade post in the area in 1776. Competing posts were set up by Alexander MACKENZIE in 1785 and the Hudson's Bay Company in 1799. From here the Athabasca brigades headed northwest. In 1846 Fathers LAFLÈCHE and TACHÉ established a mission. Their episcopal &QUOT;palace&QUOT; was a crude log shelter smeared with mud. In 1860 Sisters Agnes, Pépin and Boucher founded a convent. A landing strip was cleared in the late 1940s as a base for BUSH FLYING. Today the community is surrounded by mining, forestry and tourism and is also a centre for trapping and fishing.